Alumatech patio covers are made from solid aluminum wood textured material. It is really embossed aluminum with wood-grain textured finish. Compared with the defect of wood which absorbs water, alumatech doesn’t making it perfect for outdoors. Low maintenance and won’t rot from termites or water damage. Our Alumatech patio is guaranteed (with warranty included) that it will last longer than wood or other material. You don’t have to worry about routine maintenance. Maintenance free and resistant to the tough environment of outdoor weather. A quick squirt from your hose will rinse off any grime that’s attached to the patio cover. Alumatech patio covers can last for decades before any repairs and maintenance will have to be performed. Alumatech is manufactured out of high-quality light weight aluminum and is also manufactured to with-stand the every day stress of outside temperatures. You’ll increase your over-all look to your backyard by installing a completely new patio cover. Alumatech provides the look and appearance of wood without the price of installation and maintenance that is related to it. Alumatech provides piece of mind, as you will recognize that your patio cover is able to handle the tough conditions of the weather.Alumatech will not rot, warp, twist or burn. These Alumatech patio covers Redlands have a Lifetime Manufacturer’s Warranty. Alumatech patio covers will initially be less than a wood patio cover. Over time an Alumatech patio cover is likely to cost a lot less than a wood patio. Since these patio covers are constructed with aluminum, they’ll last longer than wood. In addition, you don’t have to repaint or repair them to look new. Alumatech patio covers are based off of a per square foot charge. This is the cost for a standard piece of Alumatech which has a load capability of 10 pounds. Because there are many versions in patio areas and size requirements, there will also be great variations in the total costs of installing alumatech. One of our experienced installers can walk you through the whole process of picking your Alumatech patio style and color. When you decide it is time for an Alumatech patio cover in your yard it usually is best to work with an authorized licensed installer. Non-licensed contractors will oftentimes offer lower rates to receive your business but provide lower quality work. General contractors with a valid contractors license signifies that they have completed all requirements to own a safe, legitimate contracting business. This license is needed by every state before one can construct an Alumatech patio cover in Redlands legitimately. Each company that has a state contractors license means that he carries liability insurance. If someone was to get injured working while building your patio cover he would have the ability to sue you. Price plays a huge role when starting on a home project but be sure to check the license of the contractor that you choose to work with before signing any contract. Found in San Bernardino County, California, Redlands is a city understood as the “Jewel of the Inland Empire”. It shows off stunning gardens and trees separating the roads. This city is about 60 miles east of Los Angeles Urban area. As per the 2010 census, its populace is about 68,000. The urban area has a moderate climate however also experiences rainfall and snowfall. Its area is initially a part of the Aguas Calientes and Morongo tribes. 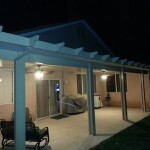 This entry was posted in California and tagged alumatech, alumatech patio covers, ca, california, patio covers, redlands.